Player-manager Alex Neil described Hamilton Academical's 4-0 over Motherwell at Fir Park as "excellent". Tony Andreu's opener was added to by Ali Crawford's double, which sandwiched a Mikael Antoine-Curier penalty. "I thought we were great from start to finish," said Neil after the club's second triumph over their Lanarkshire rivals in four days. "It's certainly one of our best performances." 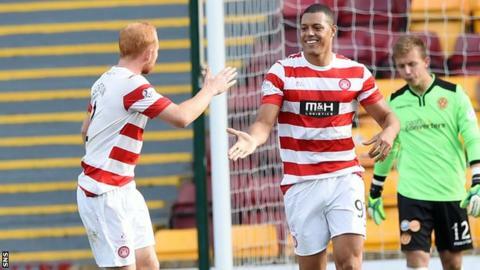 Accies, who move up to second in the Scottish Premiership, had been buoyed by their midweek penalty shoot-out win over the Steelmen in the Scottish League Cup, which followed a 0-0 league draw with Kilmarnock last weekend. "We're back to scoring ways," said Neil. "The last two games have been frustrating, albeit we beat Motherwell in the cup, but we didn't score from open play, which is unlike us and I'm glad we put that to bed today. "With the amount of chances we created, it could have been more [than 2-0 at half-time]. We limited Motherwell to not much at all. "I've been speaking about how good this team could potentially be, but I think we showed some of that today. "It's another clean sheet for us as well to keep the run going." Next up is a trip to Celtic Park on 5 October. "We're really riding high in confidence at the moment, the team's playing really well," added Neil. "Everybody wants the ball, they all trust each other and they're doing great so we'll go, enjoy the experience at Celtic and see what we can do. "We believe we can win every game."